AMSOIL 5W30 100% Synthetic 5W-30 Motor Oil (ASL) delivers extraordinary lubrication in all types of automotive gasoline engines. By combining the industry premier synthetic technology with AMSOIL premium additives, AMSOIL ASL exceeds the higher performance demands of modern engines. It withstands the stress of higher horsepower, higher heat and complicated emission control systems. AMSOIL Synthetic 5W-30 Motor Oil consistently outperforms competitive conventional and synthetic motor oils. It delivers long-lasting performance and protection. 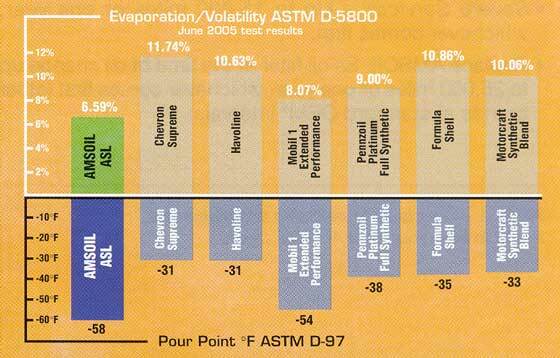 AMSOIL Synthetic 5W-30 Motor Oil resists thermal (heat) breakdown better than conventional oils. It is heavily fortified with detergent and dispersant additives to prevent sludge deposits and keep engines clean. And unlike conventional oils, AMSOIL ASL contains no wax. It stays fluid down to -58ºF for improved cold temperature oil flow, reduced bearing wear and easier starting (see chart below). (4) Turbo/supercharged vehicles, commercial or fleet vehicles, extensive engine idling, first and subsequent use of AMSOIL in vehicles with over 100,000 miles, daily short trip driving less than 10 miles (16 km), frequent towing, plowing, hauling or dusty condition driving.